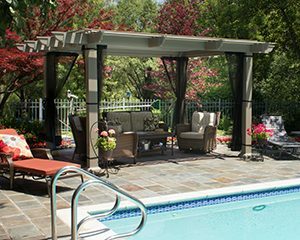 SRA Home Products is pleased to be an installer of cabanas at homes throughout West Chester, Pennsylvania, and beyond. These stylish structures are reminiscent of the ones you might find at a luxurious Caribbean resort. Whether you plan to use your new cabana as a spot for lounging next to the pool, a private changing area, or a shelter for outdoor dining, it will be sure to add a relaxing, tropical ambiance to your backyard. TEMO cabanas feature a state-of-the-art thermal roof that deflects the heat from the sun, perfect for days when you want to stay cool by the pool. They are constructed using heavy-duty, fully extruded aluminum, which offers strength superior to wood, vinyl, and roll-formed aluminum alternatives. TEMO cabanas feature a durable TEMKOR polymer coating that will stand up to scratches and dents. This is ideal for homes with children or pets who might be playing around the pool area, and for those times when a storm blows debris or hail against your cabana. If you would like to offer your guests a private spot where they can change into their swimsuits without having to go inside, we can also install optional privacy curtains on your new cabana. If you would be interested in having one of TEMO’s tropical cabanas installed at your West Chester, PA, home, please contact SRA Home Products today. We’re family-owned and -operated, and we place the highest priority on ensuring that our customers are fully satisfied, as demonstrated by our A+ rating from the Better Business Bureau.